Good news, the sink mark issues have now been addressed and we will be picking up our first batch of freshly produced cases on Thursday 24th, just in time for Easter. We will be assembling all the cases and rewards over the Easter break and shipping them out to you all early next week. 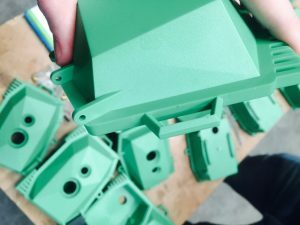 We met with the injection moulders last week and again this week to explore a number of different solutions to remove sink holes on the case without impacting the integrity, aesthetic or cause any further delays. We managed to arrive at a solution that provided good results which you can see in the before and after images below. We’ll keep you posted on Facebook and twitter as we assemble and pack the kits over Easter, and provide you with another update when we are ready for shipment next week.